It's a historic week to host the carnival-- just a week after our first year anniversary, and right upon the second year anniversary of the Japanese earthquakes and Fukushima incidents. We are proud to host the carnival on this week which includes an amazing variety of posts from leading experts and an exceptional historical significance. "...why is it that when nature heats up water with radioactive materials it’s good, but when humans heat up water with radioactive materials it’s bad?" As a part of the Nuclear Tourist Blog at the Nuclear Literacy Project, Suzy Hobbs Baker offers insights into the historical and cultural context of the German nuclear phase out. Baker suggests, "that we should all try to understand and be compassionate about their perspective whether we agree with it or not." Gail Marcus looks at some of the larger impacts of Fukushima in her blog at Nuke Power Talk this week. She points out that that the sudden shutdowns of nuclear power plants in Japan and Germany have had real consequences. Although both countries seemed to keep functioning, and some have claimed that showed that nuclear power wasn't "needed," she shows why that isn't so, and points to the very real health and economic consequences of the shutdowns. U.S. policy for preventing nuclear weapons proliferation is a two-pronged work in progress. Prong One is essentially intellectual property protection: blocking certain other countries from access to technologies and processes that can help make explosives and bombs. Prong Two is dissuasive diplomacy: using various forms of diplomatic pressure, up to and including military force, to dissuade countries from making, getting, or keeping weapons. Steve Aplin argues that only Prong Two has been successful; Prong One has been an unqualified, and unlamented, failure. As we approach the two year anniversary of the Great East Japan Earthquake and Tsunami, it’s important to look back and ask honest and direct questions about the subsequent nuclear accident at Fukushima Daiichi and what it means today. What do we know now that we didn’t in the early days? Could the accident have been prevented? What are we doing to ensure something similar never happens again? What about the radiation exposure to the public? Will Davis with an authoritative account and answering of these and many other important questions. The Japanese government is less than happy with the recent WHO risk estimates. They feel WHO’s results are purely hypothetical and can only increase the wide-spread fear of radiation infecting millions of their people. WHO ignored other studies out of Japan and within the United Nation's family itself. Japan's might be the first government to ever challenge WHO's methodology. They are entirely correct in criticizing WHO. Officials behind China's self-developed nuclear reactor, known as the CAP1400, expect to sign its first overseas orders for the technology this year, most likely from South America or Asia. 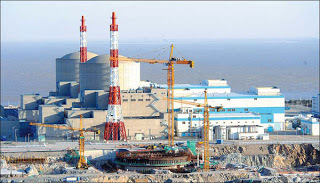 Sun Qin, the chairman of China National Nuclear Corp told China Daily in an exclusive interview, that the deals could seal should the construction of a CAP1400 reactor in China begin by the end of this year, after approval from the State Council. The Chinese technology is attractive because of the “favorable and unconditional” credit conditions offered to other nations. Cameco Corp. is just months away from opening its Cigar Lake uranium project, the world’s second-largest high-grade uranium deposit, more than thirty years after it was discovered and just as global prices for the nuclear fuel show promise of a rebound. In an in-depth interview with Frankfurter Allgemeine, Altmaier said that costs for the plans to reform and restructure the country's energy sector by the end of the 2030s could reach €1 trillion ($1.3 trillion). Feed-in tariffs - guaranteed electricity prices designed to support the adoption of renewables such as wind and photovoltaics - would alone cost some €680 billion ($910 billion) by 2020. That figure could increase further if the market price of electricity fell, he warned. The shift to renewables is lagging the phase out of nuclear energy and that is being made up by increased coal usage. Increased coal usage is increasing pollution. The current pace of renewable addition will last for many years. A UK Science and Technology Committee Report, Nuclear Research and Development Capabilities, calls for at least tripling the current number of nuclear reactors (16 reactors now) in order to meet legally binding emission targets for 2050. The eventual number could be much higher because the new unconventional reactors are expected to have a smaller generating capacity. Scenarios for future electricity generation suggest that between now and 2050 nuclear power could supply between 15% and 49% (12 and 38 GW) of the total. To meet the UK's legally binding target of reducing greenhouse gas emissions to 80% below 1990 levels by 2050 it is likely that between 20 and 38 GW of nuclear power will be needed. Is Bill McKibben really serious about climate change? Andy Revkin recently published a post on his Dot Earth blog titled A Communications Scholar Analyzes Bill McKibben’s Path on Climate. In one of the videos that is embedded in the article, Matthew Nisbet describes Bill McKibben as a public intellectual and compares his activism on climate to that of Rachel Carson on the effects of pesticide chemicals. In this post, Rod Adams makes his case that McKibben is simply not serious enough about climate change to overcome an imposed phobia or take the time to learn just why he and his followers have been taught to have that fear. Does Bill McKibben ever stop to think about how his reluctance to use nuclear energy plays into the hands of the fossil fuel companies whose behavior he is trying to alter through his divestment campaign? Rod Adams also published a detailed analysis of MHI's root cause analysis of the steam generator leaks at San Onofre. The report, in a redacted form, was just made publicly available on Friday afternoon (March 9, 2013). In 2011, the Vermont state senate voted to close down Vermont Yankee. In 2012, federal judge Gavan Murtha ruled that the reason for their vote was the concerns with nuclear safety. Since nuclear safety is regulated solely by the federal government, not state legislatures, Murtha ruled against the state. The state appealed the ruling. Nuclear opponents claimed they had been "out-lawyered," so the state hired a more high-powered attorney for its appeal. However, if the senators weren't voting on nuclear safety, what was the basis for their vote? The new attorney argued the senators were voting on economics. To bolster his argument, he cited two facts about Vermont Yankee: it provides low-cost power, and it will share money with the state utilities if prices rise on the grid. These facts are completely correct, but most people would say these are economic arguments for keeping the plant, not shutting it down. Filtered Vents and Boiling Water Reactors: It’s Not About the Costs Two NEI staffers attempt to set the record straight on the industry position on filtered vents. Why Nuclear Energy is Critical to American Energy Diversity Taking a closer look at House testimony from Entergy executive William Mohl, and how the shale gas boom won't last forever. Will Davis bounces the newly released MHI Root Cause Analysis documents and the letter to the NRC by Senator Boxer / Rep. Markey against each other to see what falls out. Detailed explanation of the causes; many background / supporting links. Thank you for hosting the carnival and for applying some creative formatting to make the posts readily accessible. In a world where people who are opposed to progress often shout louder than the majority of people who actually enjoy the benefits of progress, it is important that people who favor nuclear energy work together to help balance out the negativity that is often associated with the technology. There is little doubt that the world would be a better place with more nuclear power plants operating instead of more coal, gas, oil, wind turbines, or solar panels. "Safety-related concrete has been poured for the basemat of the first of two AP1000 units at the VC Summer plant in South Carolina. The milestone marks the official start of construction of the USA's first new reactor in 30 years."